Until now I have been working with language educators all around Europe in the TILA project and did some research at the University of Alcalá de Henares in Spain for the 'Spanish Language Route' project. Finally this Spanish project decided to use the Unity3D platform to create their course, mainly because this project did not need a virtual platform where people could meet and talk, they just wanted to create an interactive language game and sell it. 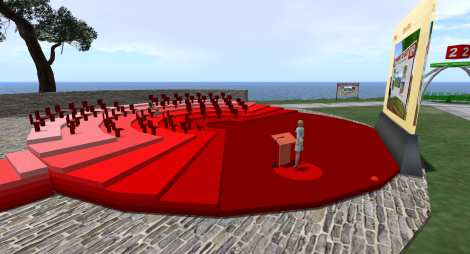 But besides language education there is so much more to explore in educational virtual worlds, like walking in historic scenes, visit a Roman fort or ancient Egypt, see monasteries from the inside, explore buildings that are not open to the public or do not exist anymore. For all the Dutch readers, there will be a FREE conference about 'Virtual Worlds in Education' at 13 november at the Fontys in Tilburg (NL).